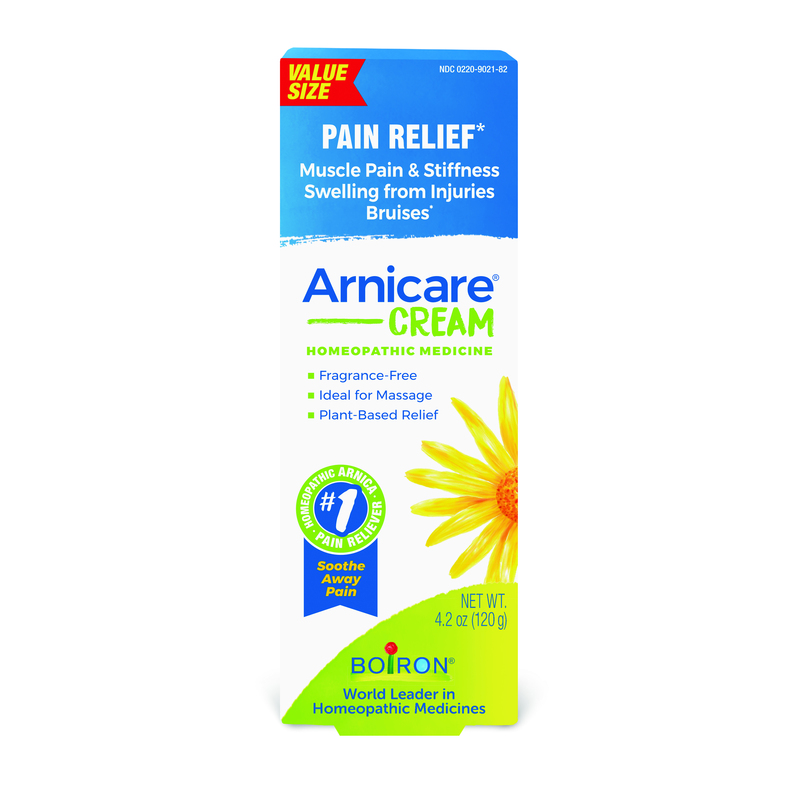 I use this Arnicare Cream (Pain Relief) by Boiron on my back and in no time I feel relief from pain. 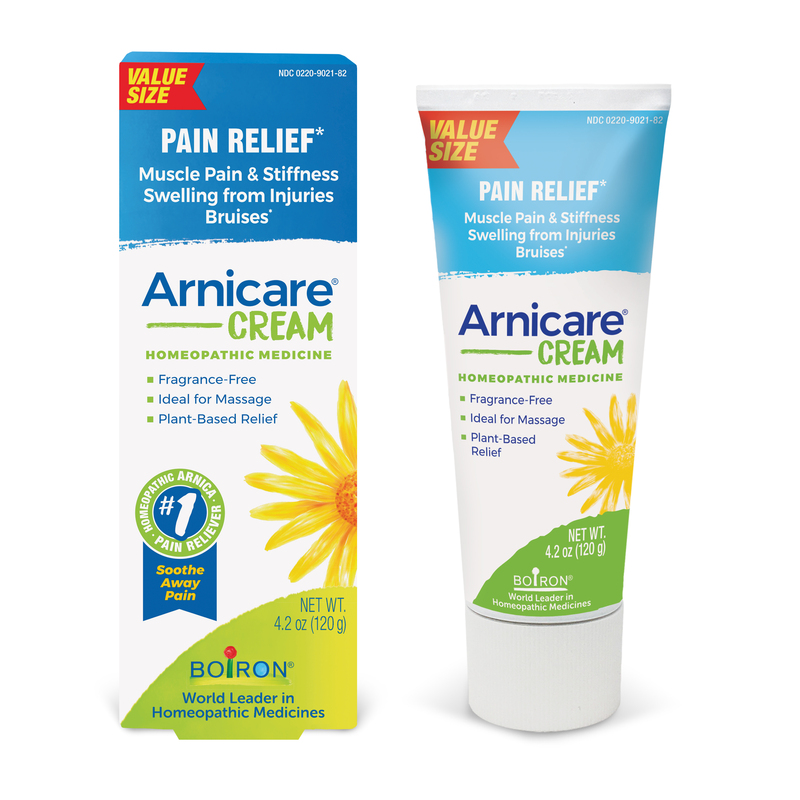 Arnicare Cream is made from Arnica montana (a mountain daisy)‚ which has been used for centuries to naturally relieve pain. Its soothing effect makes it ideal for massaging sore muscles. 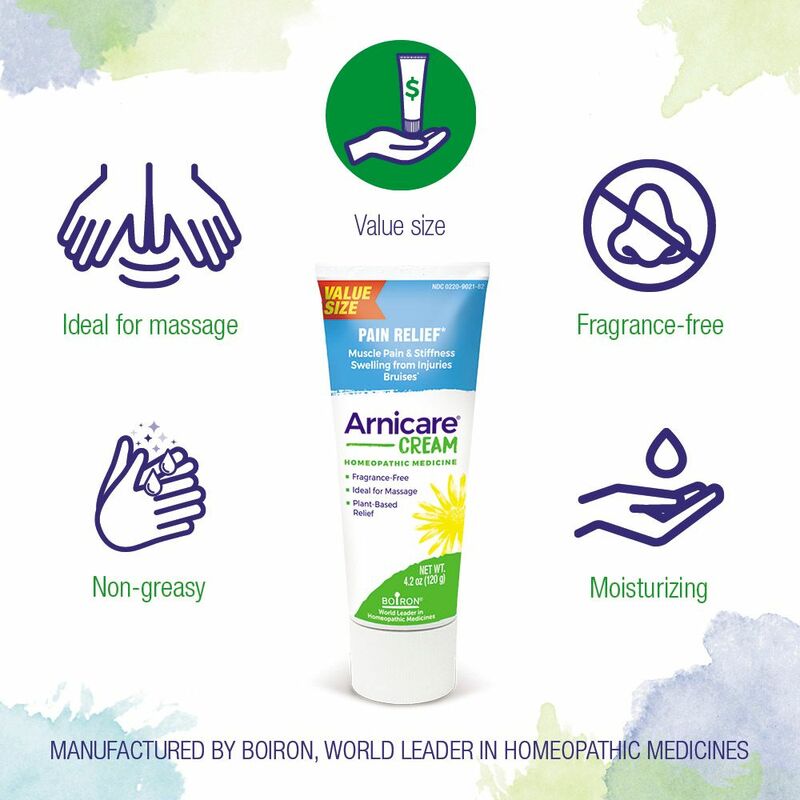 Arnicare Cream is recommended by doctors‚ plastic surgeons‚ and pharmacist‚ and used by professional athletes and savvy moms. - Temporarily relieves muscle pain and stiffness due to minor injuries‚ overexertion‚ and falls. 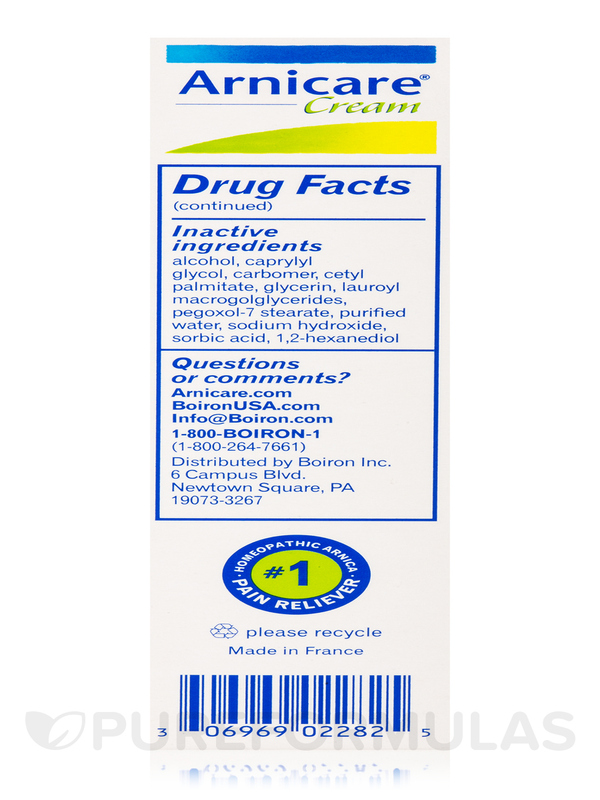 - Reduces pain‚ swelling‚ and discoloration from bruises. 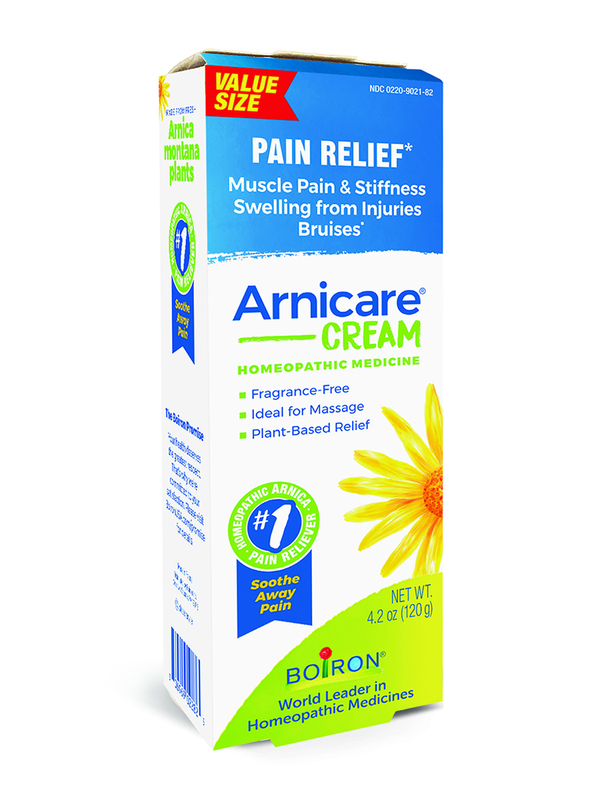 Arnica montana 1X HPUS 7% / Relieves muscle pain and stiffness‚ swelling from injuries‚ discoloration from bruises. *Homeopathic mother tincture made from Arnica montana fresh whole plant. 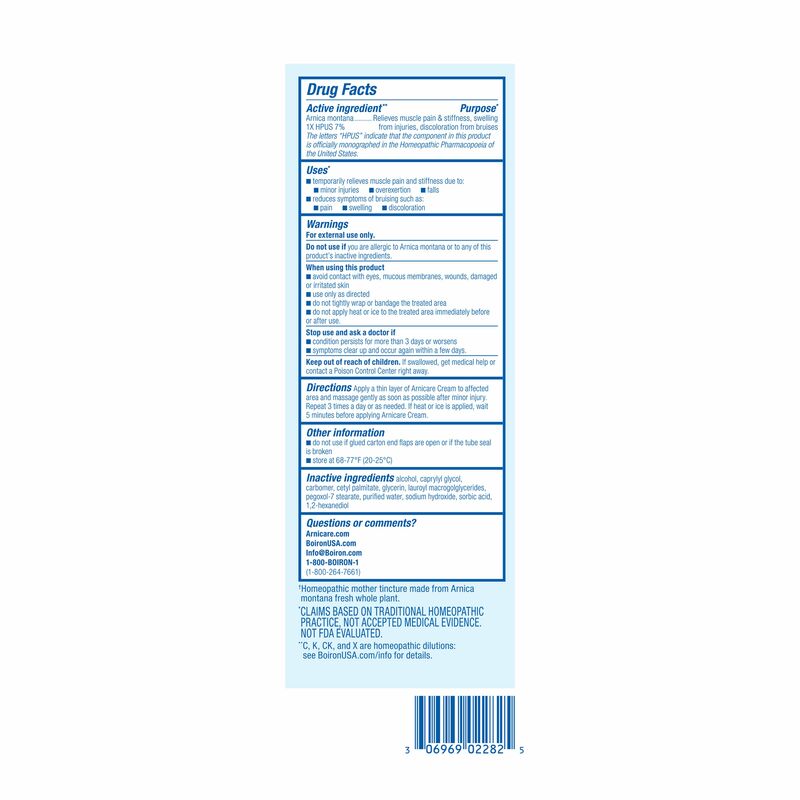 Inactive Ingredients: Alcohol‚ caprylyl glycol‚ carbomer‚ cetyl palmitate‚ glycerin‚ lauroyl macrogolglycerides‚ pegoxol-7 stearate‚ purified water‚ sodium hydroxide‚ sorbic acid‚ 1‚2-hexanediol. 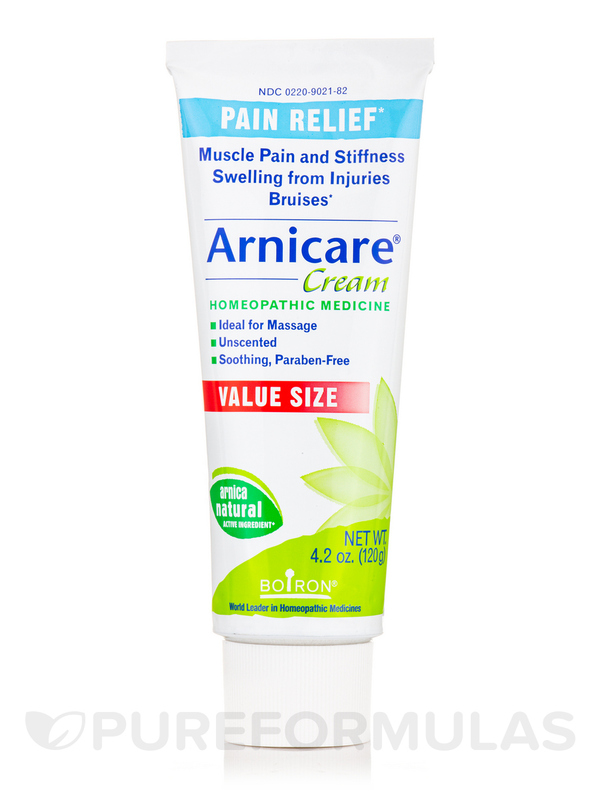 Apply a thin layer of Arnicare Cream to affected area and massage gently 3 times a day or as needed. 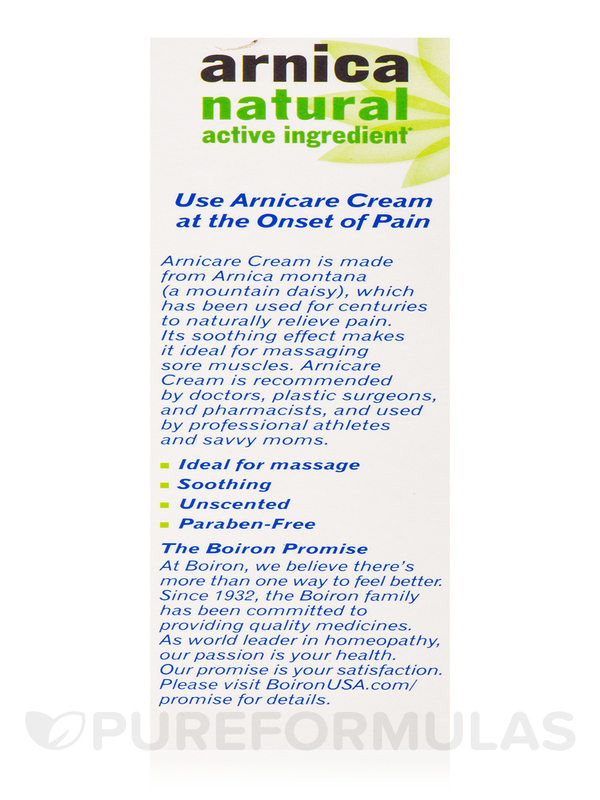 If heat or ice is applied‚ wait five minutes before applying Arnicare Cream. Avoid contact with eyes‚ mucous membranes‚ damaged skin‚ or wounds. 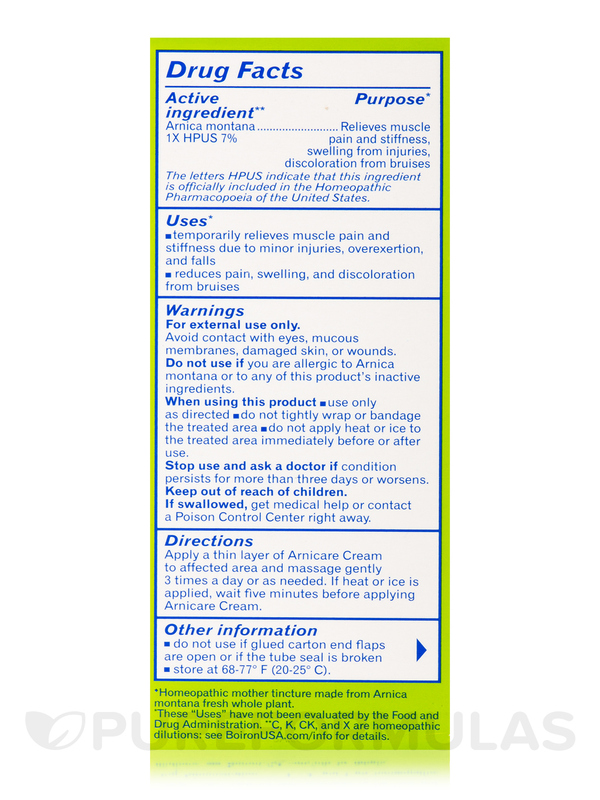 Do not use if you are allergic to Arnica montana or to any of this products inactive ingredients. When using this product use only as directed; do not tightly wrap or bandage the treated area; do not apply heat or ice to the treated area immediately before or after use. Stop use and ask a doctor if condition persists for more than three days or worsens. Store at 68-77° F (20-25°C). 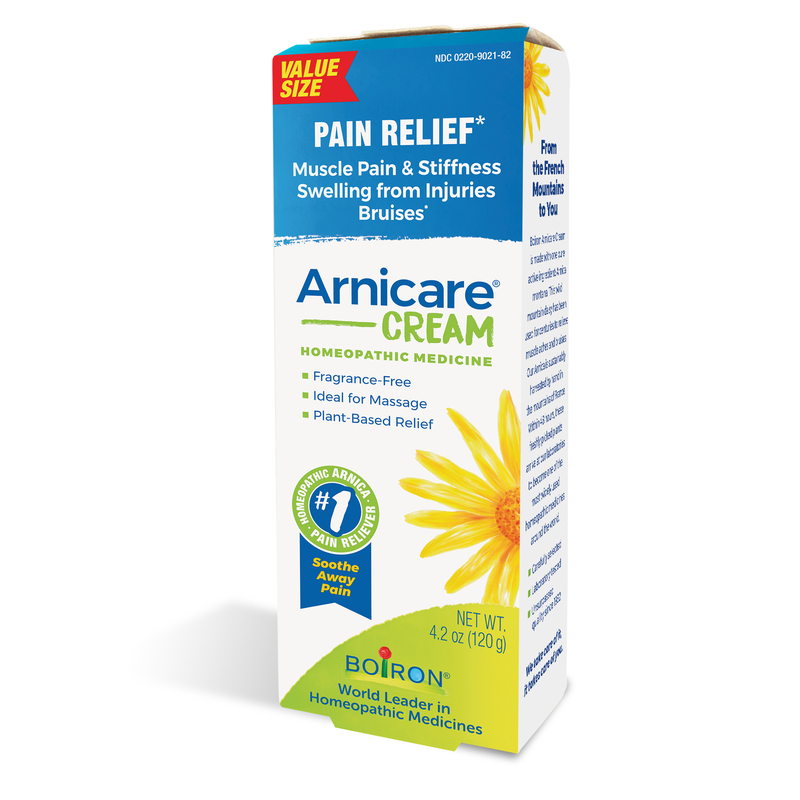 This product really helps with exercise related aches that increase with my age. There are no cons. The pros are relief without adverse side effects such as those with ibuprofen. I wish I could put it on in one second. It sinks in fast and does not leave a greasy residue. I wish it were in a plastic container rather than metal. It's hard to squeeze out the remaining product when it is almost empty.